Skyscraper-style chips; quantum dot Christmas lights; unsolvable quantum problem. With the aim of boosting electronic performance by factor of a thousand, a team of researchers led by Stanford University engineers have created a skyscraper-like chip design, based on materials more advanced than silicon. For many years, computer systems have been designed with processors and memory chips laid out like single-story structures in a suburb where wires connect these chips like streets, carrying digital traffic between the processors that compute data and the memory chips that store it. But these suburban-style layouts create long commutes and regular traffic jams in electronic circuits, wasting time and energy. The research team, which includes associate professor Subhasish Mitra, professor H.-S. Philip Wong, as well as Christos Kozyrakis and Eric Pop of Stanford; Jeffrey Bokor and Jan Rabaey of the University of California, Berkeley; Igor Markov of the University of Michigan; and Franz Franchetti and Larry Pileggi of Carnegie Mellon University describes the new approach as Nano-Engineered Computing Systems Technology (N3XT). They believe N3XT will break data bottlenecks by integrating processors and memory like floors in a skyscraper and by connecting these components with millions of “vias,” which play the role of tiny electronic elevators. The N3XT high-rise approach will move more data, much faster, using far less energy, than would be possible using low-rise circuits. Shifting electronics from a low-rise to a high-rise architecture will demand huge investments from industry – and the promise of big payoffs for making the switch. When higher speed is combined with lower energy use, N3XT systems outperform conventional approaches by a factor of a thousand, they said. To enable this, the researchers used new nano-materials that allow its designs to do what can’t be done with silicon – build high-rise computer circuits. And while engineers are continually trying to stack silicon chips, challenges remain. N3XT 3D chips are based on carbon nanotube transistors that are faster and more energy-efficient than silicon processors. 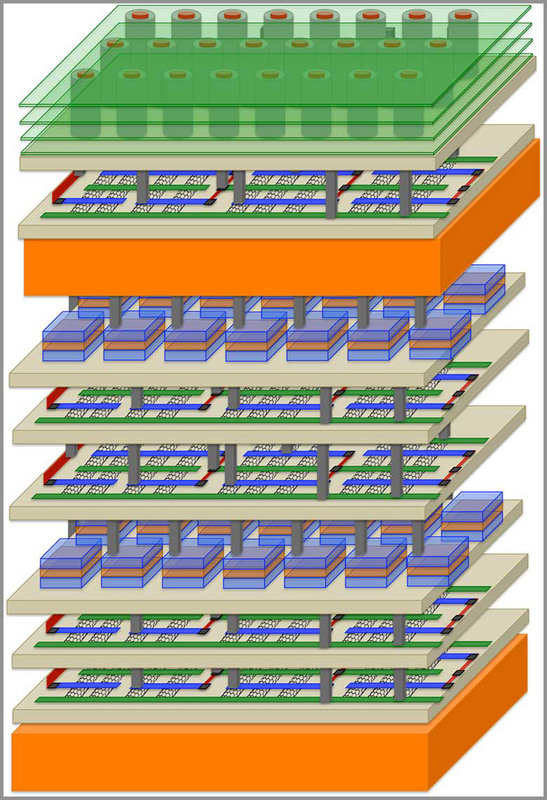 Moreover, in the N3XT architecture, they can be fabricated and placed over and below other layers of memory. Are quantum dots the lights of Christmas future? While light bulbs were a huge leap from the picturesque, traditional candle-lit Christmas tree, a lot has changed since the bulky incandescent bulbs that were used for decades as the dominant tree-lighting technology, much of which has to do with light-emitting diodes (LEDs). LEDs are more vivid, a lot more efficient, and are increasingly becoming the light of choice on Christmas trees, reminded Yale University researchers. To be sure, LED lights have since improved in recent years, thanks to quantum dots – very small semiconductor nanocrystals that can be engineered to deliver a warmer light with vibrant colors. 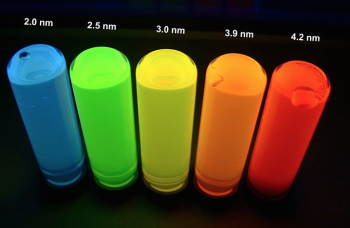 The colors emitted are determined by the size of the quantum dot, which is tunable. Already more efficient than incandescent bulbs, which burn most of their energy though heat, LEDs save even more energy with the help of quantum dots. The technology has the potential for applications well beyond decorative lighting, and because it covers a greater range of the color spectrum, it could mark a major improvement in displays for computer monitors and televisions. According to scientists at UCL, Universidad Complutense de Madrid – ICMAT and Technical University of Munich, a mathematical problem underlying fundamental questions in particle and quantum physics has been proved to be unsolvable, marking what they say is the first major problem in physics for which such a fundamental limitation could be proven. These findings are important because they show that even a perfect and complete description of the microscopic properties of a material is not enough to predict its macroscopic behavior. The researchers explained that a small spectral gap – the energy needed to transfer an electron from a low-energy state to an excited state – is the central property of semiconductors. Similarly, the spectral gap plays an important role for many other materials. When this energy becomes very small – i.e. the spectral gap closes – it becomes possible for the material to transition to a completely different state. 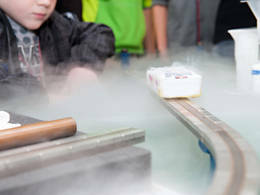 An example of this is when a material becomes superconducting. Mathematically extrapolating from a microscopic description of a material to the bulk solid is considered one of the key tools in the search for materials exhibiting superconductivity at ambient temperatures or other desirable properties. The team has shown crucial limits to this approach. Using sophisticated mathematics, the researchers proved that even with a complete microscopic description of a quantum material, determining whether it has a spectral gap is, in fact, an undecidable question. Why is this important? The researchers are now seeing whether their findings extend beyond the artificial mathematical models produced by their calculations to more realistic quantum materials that could be realized in the laboratory.